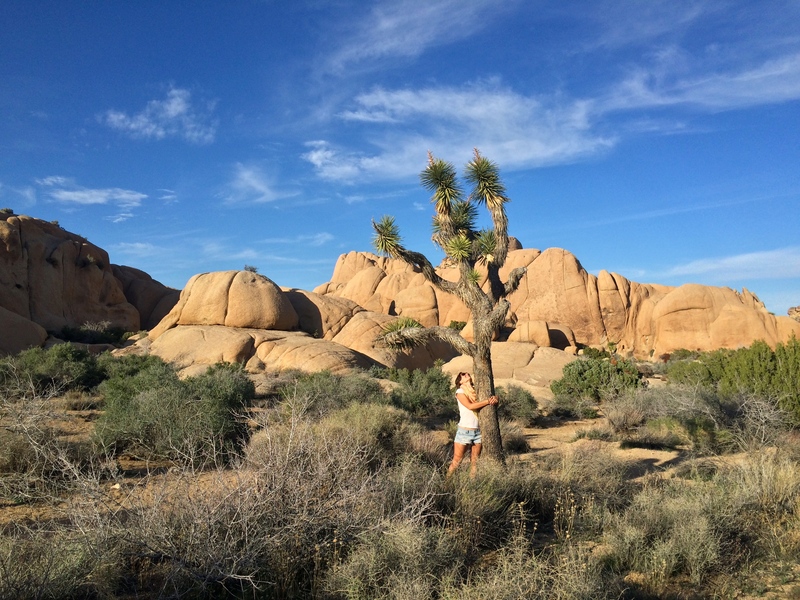 Joshua Tree National Park has always had a special place in my heart. I am an ocean lover at heart, the connection I feel with peaceful red rocks and the desert sun is undeniable. 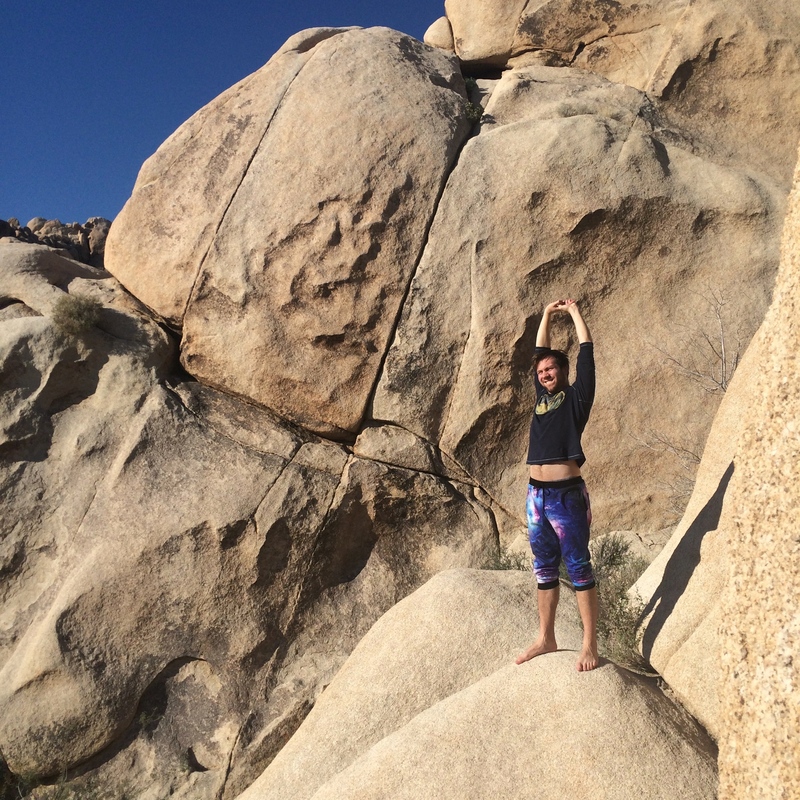 This was my third time going to Joshua Tree, and my first time camping in the park. My friend Adam and I drove from Los Angeles and had some good old fashioned fun ranging from hiking in the blazing sun at day to stargazing at night. Here’s a few highlights of our trip that I highly recommend. 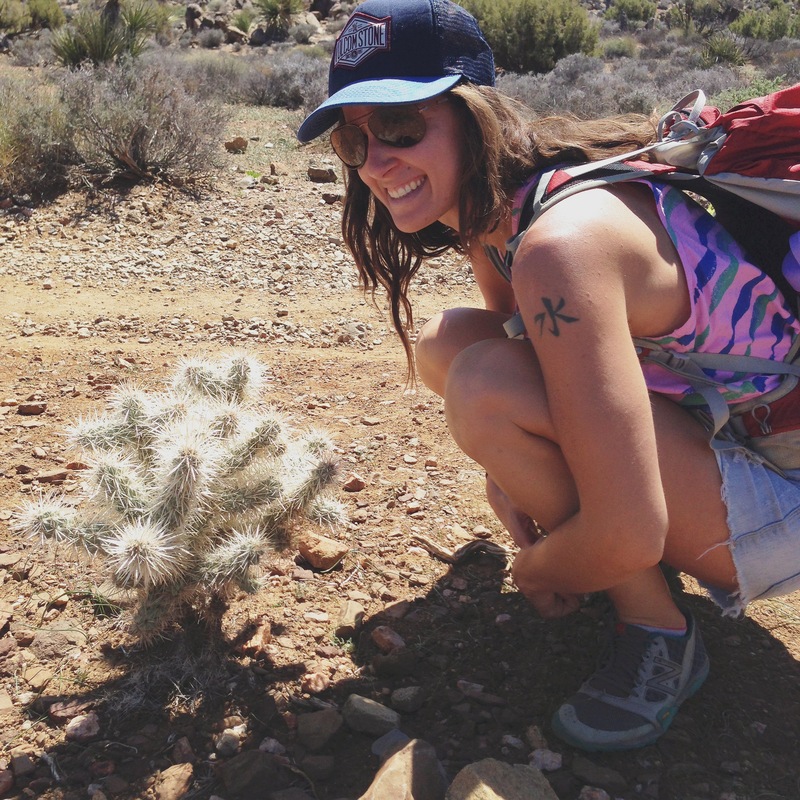 Joshua Tree National Park is well suited for the guessing game. What does that rock look like to you? The usual answer for me was something in the carb family; a loaf of bread, or pizza dough that someone just threw randomly from the sky. Although there is a scientific explanation for the rock formations, there is no need to overthink it; just let yourself marvel at the spectacle. 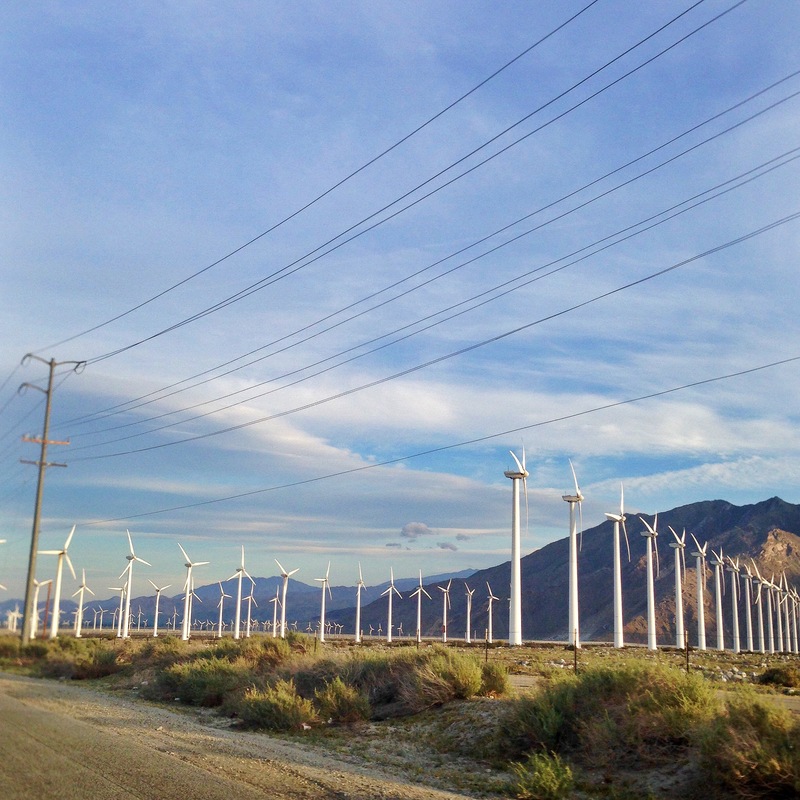 The trees are trippy, the cacti abound, and you will spot rabbits, coyotes, and if you’re lucky even desert turtles. To grasp the true essence of the park head to the Western Entrance, walk Hidden Valley, stop by the Wonderland of Rocks or take the 1.7 mile loop that starts at Skull Rock. Doesn’t this rock remind you of an english muffin? We camped at Indian Cove campground because it was close enough to town that we could easily go in for a hot meal at night. It also offers a great scenery of cool rocks and a younger, rock climber crowd. There are no flush toilets nor showers, but water is conveniently available at the ranger station at the entrance of Indian Cove Road, so bring containers. We brought a solar heated camping shower which, after being hung from just about any rock, provided for glorious showers with amazing views. Other feasible options for camping are Black Rock campground (which is the only campground in JT that has flush toilets and running water on site). I got the impression that campground was a bit more family oriented and also farther from town. 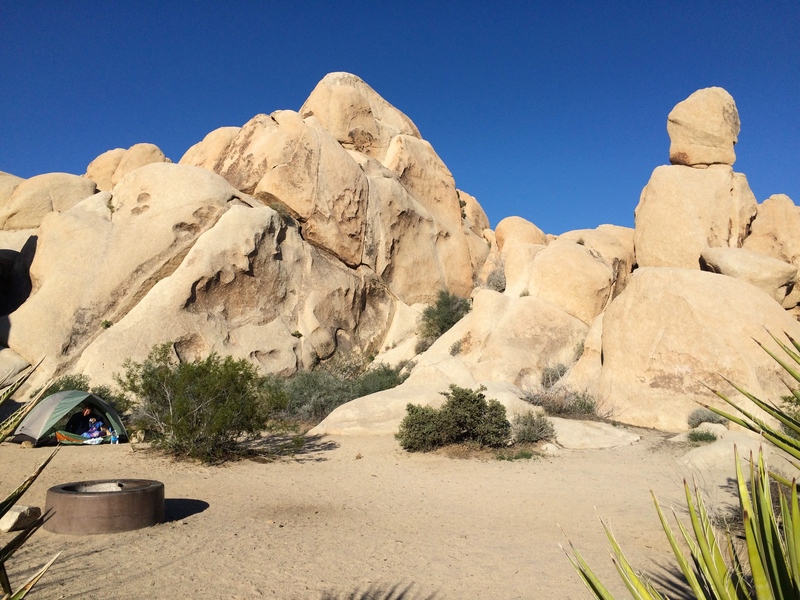 If you’re wanting to really dig in the real camping experience and be more inside the park (so bring your own water and food) definitely consider camping at Sheep Pass campground, Jumbo rock, or Belle. 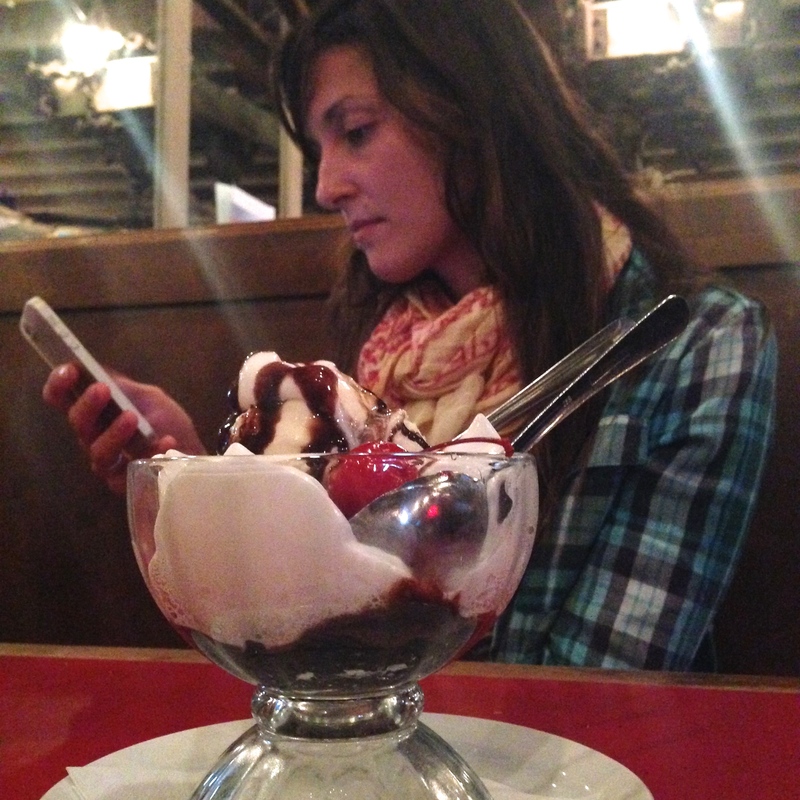 If you’re wanting something more home like, I highly recommend Desert Lily. The several cabins to pick from are uber cute and all decorated different. The rustic B’iltomore Bunkhouse, my favorite, has a cowboy spa, which consists of a horse trough where I spent unforgettable afternoons soaking in cool water during the sweltering desert afternoons. Back in 2012 enjoying some of the best afternoons ever spent soaking in the Desert Lily’s repurposed horse trough while gazing in the desert, sipping Chardonnay and reading the Picture of Dorian Grey again since high school. When you enter the Joshua Tree Saloon , you’ll feel you entered some kind of western movie, except for the hipster crowd of rock climbers from LA and Colorado. The saloon has Blue Moon beer on tap, and that was enough to make me want to go back every night. The BBQ bacon burger is heavenly and you can’t go wrong with the molten chocolate cake with vanilla ice cream for dessert. Play of game of pool with the locals or listen to the Spaghetti Wrestler live band and you got yourself a fulfilling night out in the desert. Another good place to eat is Crossroad Cafe, which, as the name suggests, has more of a cafe-y feel and less people watching than the saloon. Pie for the People pizza has good reviews (although we felt that pizza was too much for desert dryness). The Health Foods market is a good option for stocking up on food but it closes early (6pm). 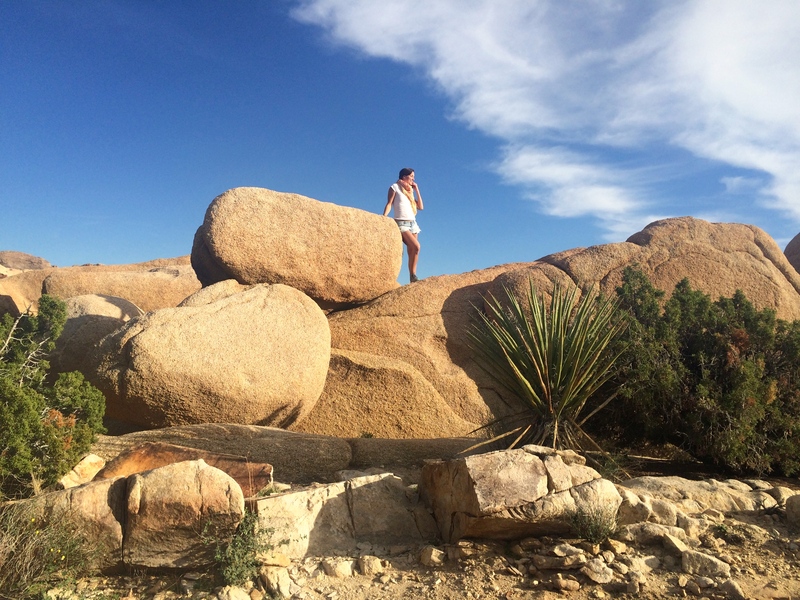 Whether it’s to find a place to hang your shower, or take a photograph, or goof around, when you’re in Joshua Tree National Park your life becomes rock-centered. 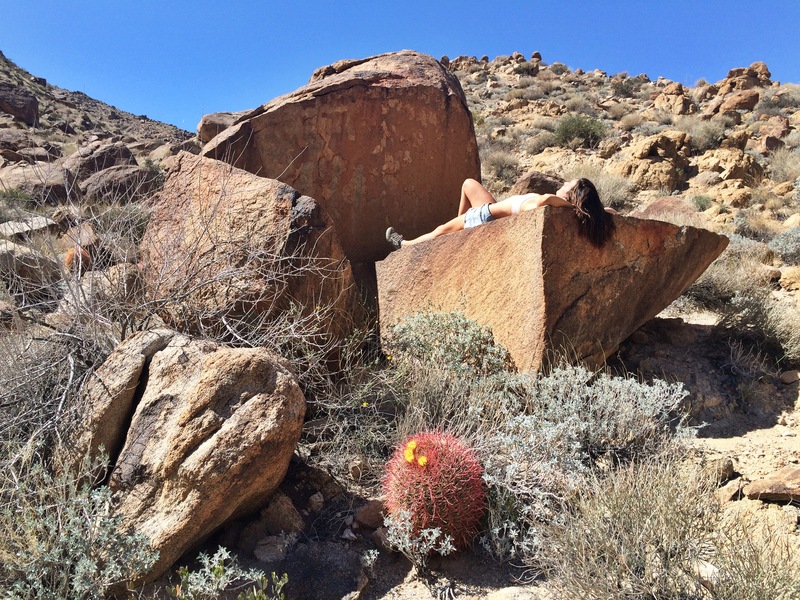 My other three favorite rock related activities were picnicking on rocks,trying some baby-climbing and suntanning on rocks. 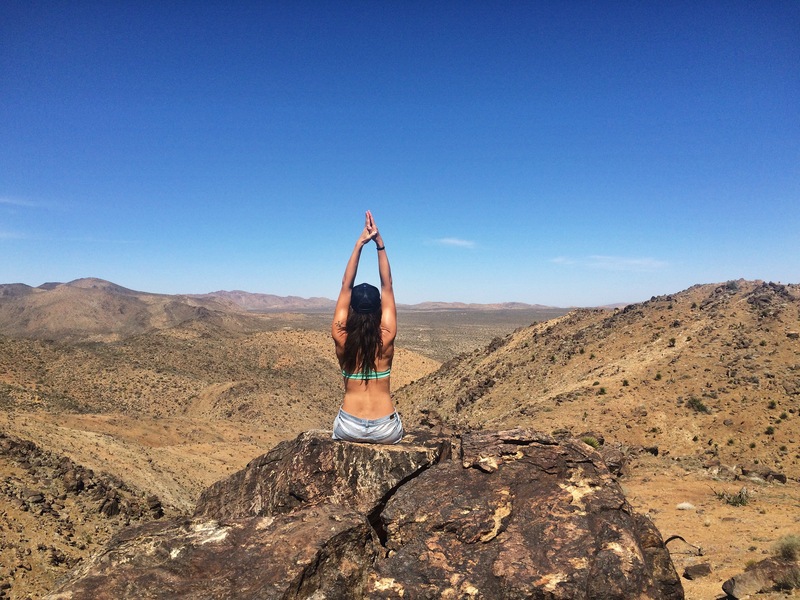 There is nothing more rewarding that going for a long hike (or as most of the guides described them- moderately strenuous) and treating yourself to a picnic with a view. We brought avocado, tomatoes, crackers, lots of fruit and of course water. 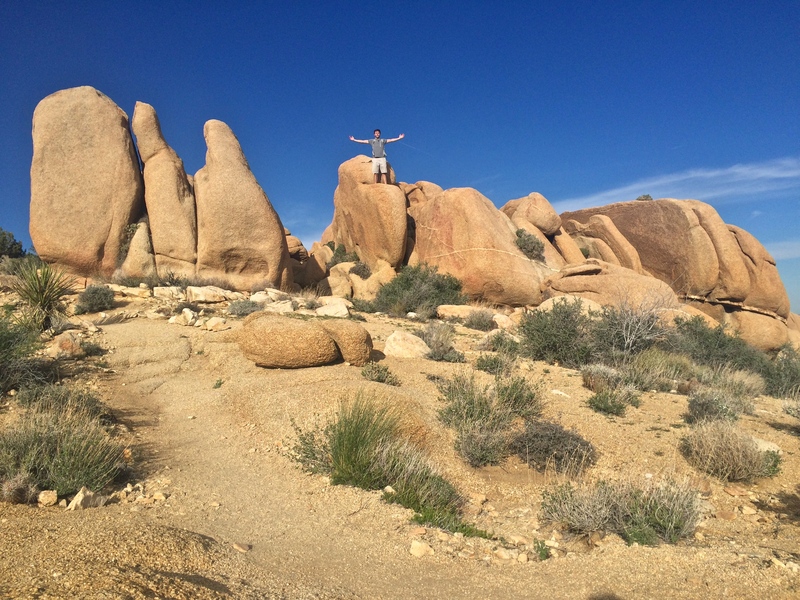 The other cool thing to do while you are surrounded by the magnificent JT rocks is to climb them. Those rocks are asking to be climbed. 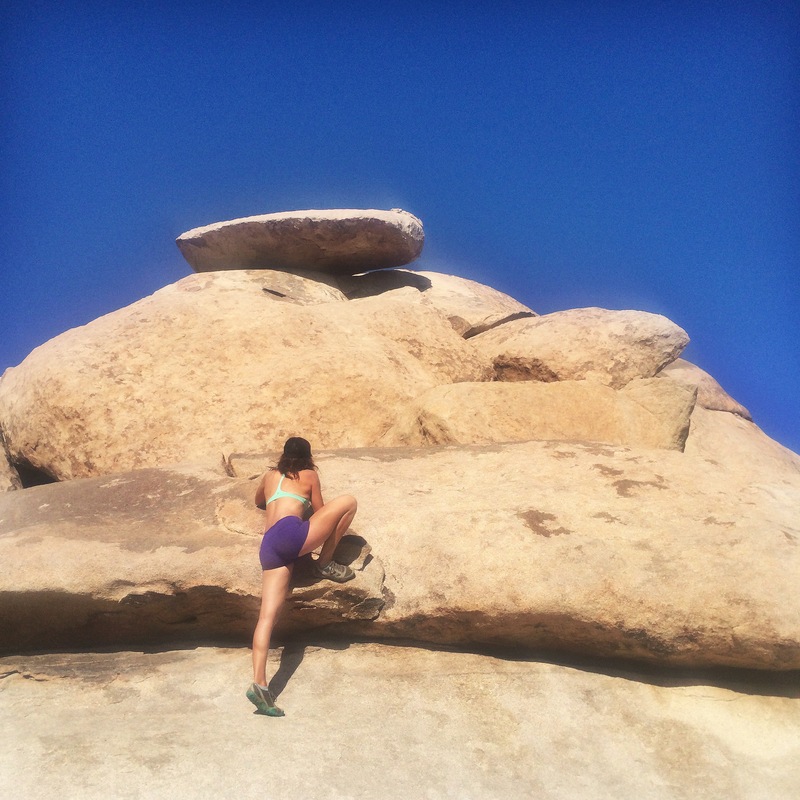 And even for someone like me who is deathly afraid of heights, a little “bouldering” comes easy thanks to the roughness of the rocks surface and the myriad of ways in which they are placed. 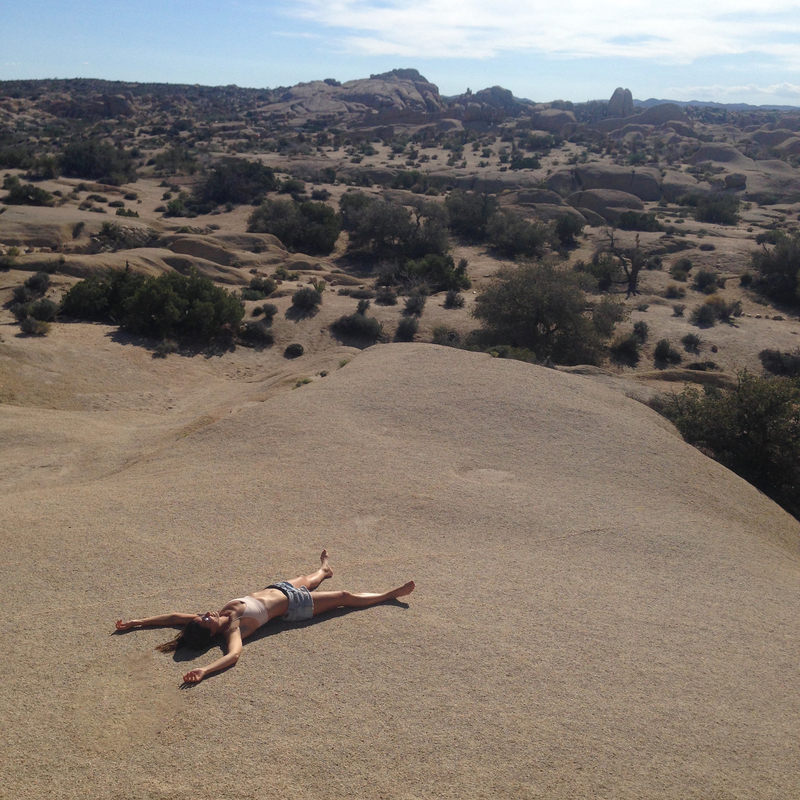 But my ultimate favorite activity is to lay on big slabs of rocks, lizard like, to suntan or take naps. That one is pretty explanatory. 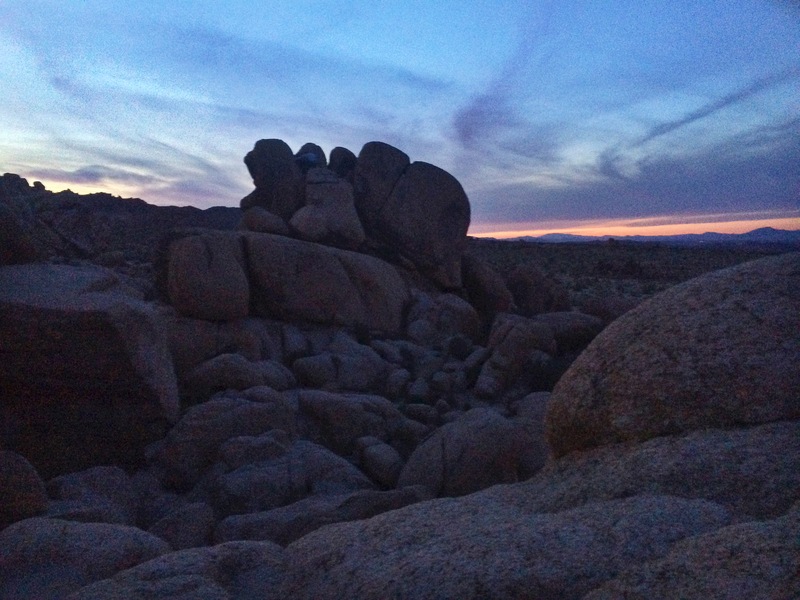 I would say Cap Rock and Jumbo rock are excellent for all those activities above, as well as the Barker Dam loop hike. Also catching the sunset while you are in the park is a must. Key Views trail offers a great panoramic of the whole valley at sunset, but if you’re like me and prefer rocks and solitude, you can avoid the crowds and climb just about anywhere to enjoy your private sunset watch. 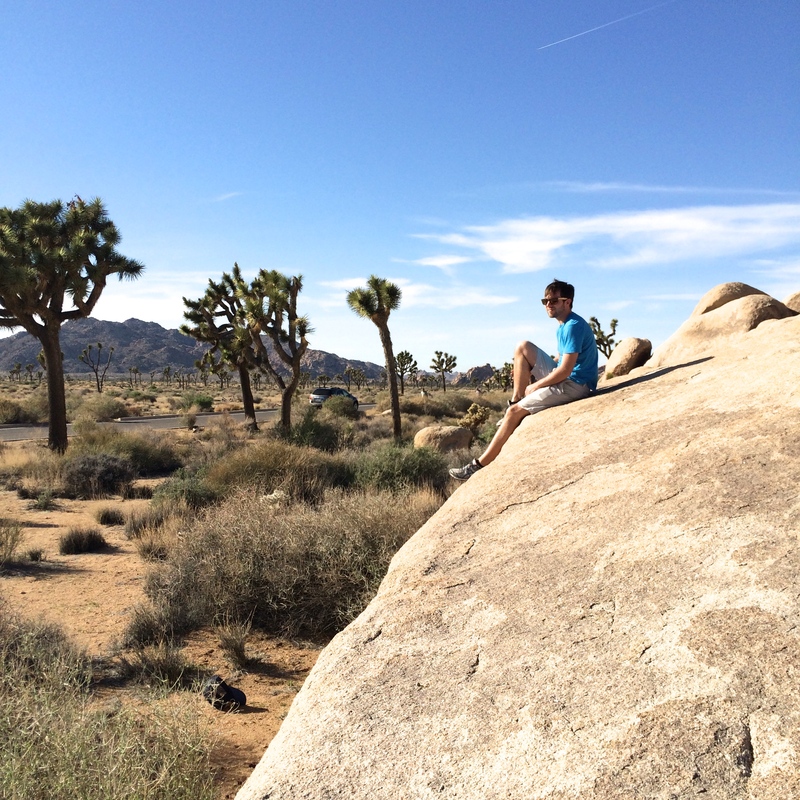 For more pictures of my trip check out MY INSTAGRAM ACCOUNT or Joshua Tree National Park’s INSTAGRAM ACCOUNT. 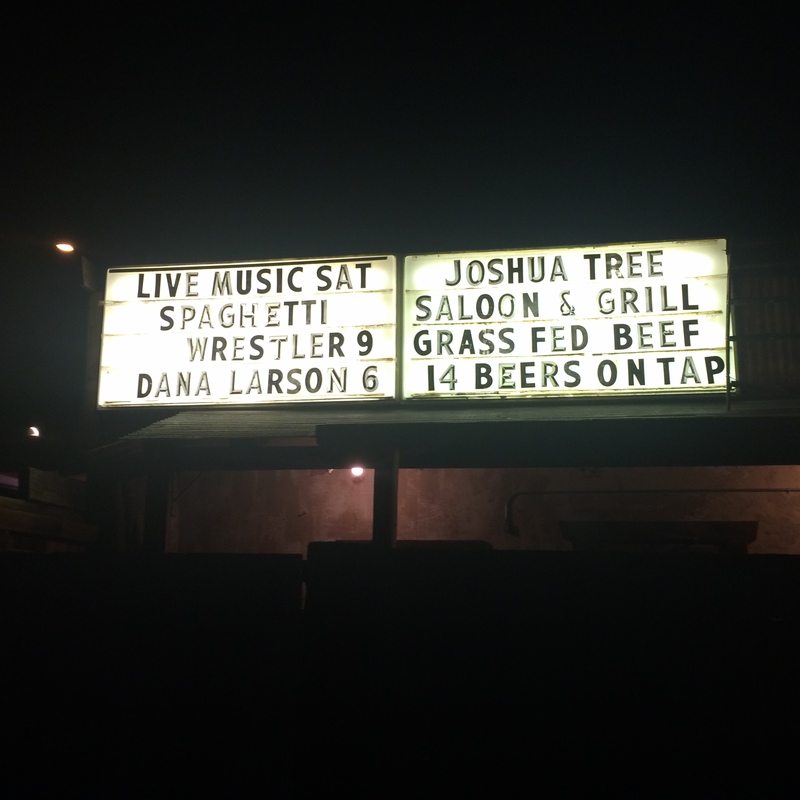 Love Joshua Tree! Nice photos!